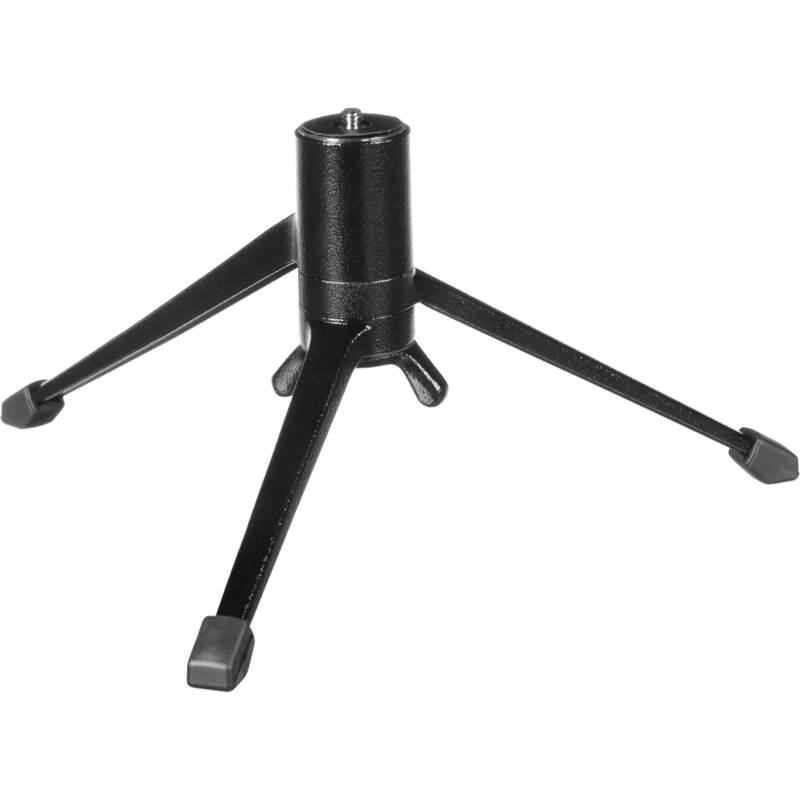 Box Dimensions (LxWxH) 8.1 x 3.4 x 1.4"
Table Tripod is rated 4.8 out of 5 by 24. Rated 5 out of 5 by Lo-Yi from Leica Tripod I use this tripod, together with Leica's Ballhead, as a chest pod for my Nikon D90 and Nikkor 18-200 lens. I press the three legs against my chest and tilt the camera to my eye. My body acts kind of like a monopod, giving me stability for available light images. This Leica Tripod and Ballhead have served me for over thirty years. Yet I see their coming demise: the new CMOS sensors that record at ISO 6400 and higher. This may make tripods and even image stabilization obsolete for most situations. Rated 5 out of 5 by Jonathan K. from Full Frame DSLR Stability I've now gone through 3 different tripods. I should have purchased this as my first and only. First purchase was the Ultrapod II used for backpacking. Lightweight...Great Design...but plastic, and it just can't handle a full frame DSLR with L glass.. Next, Cullmann Magnesit Copter. Far more stable than ultrapod, but still stability marginal for full frame DSLR and L glass, but I will say its dirt cheap for what you get. Finally settled with this Leica with Really Right Stuff 25 head. Heavier than I would like, but built like a tank. Super Stable. Robust design to last forever. You get what you pay for. If you don't have to go ultralight, and you've got a heavy camera or you prefer well built equipment, get this and be done. LOVE IT. Rated 2 out of 5 by Joel from Newer alternatives from other big names may be better bets - This tabletop tripod is fiddly, the rubber feet are too mushy to trust with longer exposures and the length of the bolt protruding from its top is too darn short for me to use reliably. Returned after one weekend. Rated 4 out of 5 by twolabs from Simple, Sturdy and Versatile Simple and elegant design, the three legs can be rotated to many possible positions with an easy twist of the wing nut on the bottom. Coupled with a RRS BH-25 ballhead, it's perfect for those times when lugging a full size tripod is impractical. Rated 5 out of 5 by BR photog from Stable and solid support for pro bodies I bought this to use not only as a tabletop tripod but for a chest-pod when using my D800 with pro lenses. I mounted a Really Right Stuff BH-25 ball head on top which provided enormous flexibility and support. This little tripod fits in my pocket but can easily support a D3s with 70-200 lens! It was admittedly a little pricey but if you want stability and longevity this can't be beat. Rated 5 out of 5 by Pixel Peeper from Small Yet Sturdy Have my Markins M10 w/ RRS Clamp and 40D w/ 24-70mm F2.8 mounted on this little tripod. The tripod can handle this weight pretty easily. Not sure what the max load on this tripod is but it seems pretty rock solid with the equipment I have. A little pricey, but for peace of mind, it's worth it. Rated 5 out of 5 by Pete M from Very Stable Very very sturdy and works well with the Leica Ball Head. It's not as quick to deploy as a tripod with legs at a fixed angle that fan out from the center but you do gain better positioning flexibility if you need to use it some place where even spreading the legs isn't practical. It will last a lifetime. Expensive, especially when you add the ball head, but it's really a great set up. I am very happy with it. I am using it with a Leica X1. I would not try. This tripod is very well thought out as is. I cannot find any technical data on this item. What is the diameter of the top plate which has the screw for mounting a ball head, clamp or camera??? Thank you! What is the Base Diameter size? Thanks! 30cm. The longest leg from the middle is 15cm. What is the weight holding capacity? Nancy,The Leica tripod has been a staple in Leica's inventory for decades. Construction is superb but from a design perspective the product suffer from a lack of development. As you are probably aware, the legs do not splay. They rotate about the center column. For approximately equal deployment each leg must be held in position with your fingers while tightening the lock screw located on the bottom of the column. Other manufacturers that have produced similar designs res stops to quickly deploy the legs. This makes setup quicker and easier because each leg need not be held in place while securing the bottom screw. As other responders have I with other responders that the tripod will support just about any lens/camera combination you are likely tot mount on a tabletop tripod. Beautifully built, somewhat moe dillicult to pack and transport and not as quick to setup as more recent designs. Will this work on the Leica M8? Not sure, I have used it, with the Leica Ballhead attachment (B&amp;H Part #LEBSHL) to connect to a Canon 5D Mk III and it works perfectly. Will a Nikon D3300 fit on it? Reading the posts on the Leica user websites, i would say yes and they recommend the Leica 14110 ball head to give you both added height and flexability in framing your shot.